The legal experts at Holiday Illness Claims have helped a Merseyside family of 4 successfully receive £8,740 in compensation after they were struck not once but twice by holiday illness in the Dominican Republic. The Moulsdale family had high hopes for their November 2013 stay at the Grand Bahia Principe Punta Cana and greatly looked forward to the hotels five-star facilities. Sadly, insect bites and gastric illness soon turned their holiday dreams into a nightmare. 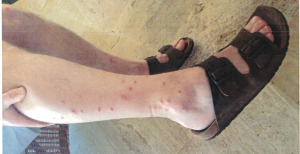 Speaking to the specialist solicitors at Holiday Illness Claims, 37-year-old Nicola Moulsdale vividly recalls waking just days into the £6,000 holiday to find that she and her family had developed angry red spots that covered much of their limbs. It appeared we were getting bit whilst we were sleeping, she states adding that the bites were not only unsightly but painful and itchy. Although the Merseyside family immediately made the tour rep aware of their plight and were assured that the room would be properly fumigated, Nicola is doubtful that this ever took place. She also remains sceptical of their customer care, remarking that not once did they offer to change the mattress. Things soon went from bad to worse for the Moulsdale family as all four members were struck by gastric illness and were forced to seek medical treatment from the resort pharmacy. Unfortunately, for Nicolas sister-in-law Lynn, over the counter medicines offered little relief. The stricken holidaymaker paid out $597 in doctors fees and received a course of injections to help ease her symptoms. Astoundingly, all four members of the Merseyside family remained plagued by repeat bouts of sickness for upwards of ten days, completely ruining their much-anticipated Dominican Republic getaway. Weeks would also pass before the family made a full recovery from the effects of the insect bites. Nicola argues that this double hit of holiday illness meant that they effectively paid £6,000 only to receive the benefit of two days holiday. Following their illness-laden stay at Grand Bahia Principe Punta Cana, the Moulsdale family resolved to pursue a claim for holiday illness in the Dominican Republic. Anne Thomson, head of travel law at Holiday Illness Claims was their first port of call. Anne handled all four of the familys claims on a no win no fee basis and negotiated a successful total settlement of £8,740 with tour operator, First Choice. Commenting on the case, Anne said: I am delighted with this result and I trust that the Moulsdale family are equally delighted. At Holiday Illness Claims we understand how distressing falling ill on holiday can be, especially when stricken holidaymakers face out of pocket expenses for medical treatment. Thats why we aim to make the claims process as simple and hassle-free as possible a dedicated holiday illness lawyer will handle every aspect of your claim and negotiate on your behalf to ensure that you receive the best possible outcome. I would strongly urge anyone who has been unfortunate enough to suffer from illness on a package holiday in the Dominican Republic within the last three years to come forward and contact Holiday Illness Claims to see if you too are eligible to make a no win no fee claim. Nicola added: We are over the moon with the result. With over 50 years experience in travel law and an unrivalled claim success rate, Holiday Illness Claims have the expertise and background knowledge to help you receive the compensation you deserve following illness abroad. To make Holiday Illness Claims your first choice for legal representation, call 0800 01 54321 now. Alternatively, simply complete the online contact form and a Dominican Republic claims expert will be in touch shortly.